With a deep sigh, Helen sits down at her desk. Today is her writing day. Helen is a marketing coach, and she tells herself she must, at last, write her coaching page. How else can she attract more clients? She sips her Jasmine tea, and mutters to herself that she must stop procrastinating and start writing. But she feels sooooo uninspired. She performs a quick Google search for inspiration. Ouch. A search for “marketing coach” generates 462,000 results. She has to describe her service with personality so she can attract her favorite clients. And when she does her best work, clients will rave about her, and her reputation will spread naturally. The theory sounds good. But Helen feels stuck. How does she describe her coaching offer with more flair? I recently read the thriller “The Quality of Silence” by Rosamund Lupton. From a writing perspective, the numerous descriptions of the coldness caught my attention. Think about it for a sec … How would you describe a cold day? Extremely cold? Freezing? Ice-cold? It’s so cold you can’t stop shivering? In the book, Yasmin arrives in Alaska with her deaf daughter Ruby. They drive in 24-hour darkness through the frozen wilderness searching for Ruby’s lost father. It’s FREEZING cold; like the air is made of broken glass. Our English cold is all roly-poly snowmen and ‘woo-hoo! it’s a snow day!’ a hey-there friendly kind of cold. But this cold is mean. Yasmin put on her Arctic parka and face mask and mittens before getting out of the truck. Even so, the cold shocked her; it was like plunging into a lake, not air. She’d thought the color of cold was white, like snow, or blue perhaps, like on a cold tap, but cold like this was conceived in a place without daylight and was black, the absence of all light and color. It’s getting so hard to breathe, my lungs are filling up with ants and there isn’t room for air any more. There’s a monster made of cold, hard as the edge of a pavement, coming towards us in the dark and it’s cutting through the windscreen and doors and windows and the only weapon against it is heat, but we don’t have any heat. To write descriptions that ooze personality, go beyond the obvious. Think a little harder to find strong imagery to fully engage your reader. This works for anything, whether it’s the scenery in a fiction book, a product description on an ecommerce site, or the service page on your website. 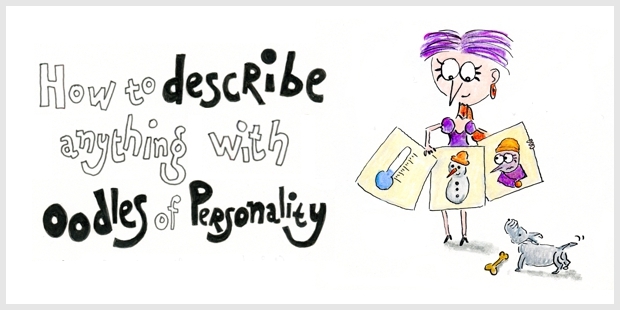 Writing with personality starts with being more descriptive. Pay attention to details. She’d seen cold as a predator, made of the dark, as if it were alive. But she felt it now as vastly, cruelly impersonal; a frozen darkness absorbing you into itself. She felt it filling her hollow spaces, embedding itself as icy marrow in her bones and then consciousness seeped away from her into the Arctic blackness. Before we hit up journalists we test your content with a real audience of at least 1,000 people using Reddit. We make adjustments based on audience feedback, so we’re confident about the success of your content even before we start pitching. No matter what service you supply, it’s easy to think your clients know what you do. But do they really? Probably not. So, take a potential client by the hand and show her, step by step, what you do for her and how you make her life better. Don’t skimp on the details. Have you considered what cold smells like? She smelled the cold and then realized that it was an absence of all odors. She wondered if it was because her airways were not functioning properly – she could feel the little hairs in her nose freezing – or if it was that in this degree of cold no molecules could permeate the air. When you appeal to the senses, readers experience your content as if they can really see, feel, hear, smell or taste it. (…) this drink tastes of sunshine. Not that watery stuff that you get in the UK for five or six days of the year, but the great, clear, life-affirming rays that you’ll only find where these fruits are grown. So even if you’ve used up your holiday allowance on lots of mini-breaks to Prague and Oslo, you can still find a little bit of the tropics in this recipe. Just close your eyes, whack on the factor 16 and have a mouthful. Il fait soleil. Sound difficult for a service? If you struggle to describe your product or service, ask your clients. What was their experience like? Can they provide a detailed description? What experience can they compare your service with? What impact does the cold have on your body? She took a breath and the freezing air went into her lungs and she felt them going into spasm. She gasped and more cold air went into her lungs and it was as if she were drowning. When you read such a vivid description, you can almost feel the cold air and the spasms of your lungs. The Purple Smart Comfort Grid™ effortlessly isolates motion, so you don’t feel your partner, posterity, or pets when they wiggle about. The only mattress that intelligently adapts to the human body for mind-blowing, personalized comfort. Translation: Wake up every morning with your happy face on. I loved waking up in the mornings during this class. I knew something exciting was waiting for me—a next lesson, a new assignment or a new comment. Henneke’s Enchanting Business Blogging course is like fentanyl for chronic writing pain. For me this course undid 20+ years of misguided writing habits. Writing your own service description can feel hard. But you don’t have to do it alone. Ask your clients for their input, and use their testimonials throughout your page. You might think that writing with personality should come naturally. But writing often doesn’t work like that. You have to work a little harder to inject personality into your writing. So, follow the three steps. 1. Write with piercing precision. 2. Appeal to the senses and use strong imagery. 3. Let readers feel the personal impact. That’s how you engage your readers with power and pizzazz. And discover your writing genius. But, I know for certain that a couple people who I WANT to see the beauty in a personable, relatable, more fun style, just hate my work. I totally love the quote examples for how cold and variable cold can be and feel and sound…with words… lending personality. Brilliant. Not everyone needs to like your writing, and the stronger your voice the more people will fall either in the love-your-writing or hate-your-writing camps. There are also plenty of people who don’t like my writing. They may think it’s boring or childish. And one person has mentioned that my writing was too masculine (whatever that may be). I also get complaints about my word choice sometimes. But I write for the people who feel I’m writing for them, so most of the time, I ignore criticism (not always of course, sometimes it is valid). I don’t know why you feel that some people hate your writing and you want them to see the beauty in your writing. If it really matters that much to you, ask them for their input and ask them to be specific in their comments. Is there too much imagery? Is the imagery too strong? Do they not like your word choice? It might also be something completely different. But be careful. Not everyone has to like you. Haha! ‘..so you don’t feel your partner, posterity, or pets when they wiggle about.’ I am jealous of that joke. I love this one: ‘It’s FREEZING cold; like the air is made of broken glass.’ Now there’s a good writer. Do you recommend the thriller? And yes, I enjoyed the thriller, especially the first 3/4 or so. It’s well written. Ah, yes, sloppy reader, me. You have the most uncommon way of stirring my thoughts. Yes, writers provide intangible services. But it is the injection of the writer’s personality that brings life to a pile of written words to influence a reader. Again you dealt with the ‘how’ in your usual amazing and easy-to-follow way. Thank you, Paul. I’m glad you enjoyed this post, and I appreciate your comment. Happy writing! This was a great and helpful post, I will try these techniques in my writing from now on. I really must read that thriller, you have made a great case for it! I hope you’ll enjoy the thriller. I thought it was a good read (especially the first 3/4). I can’t wait to write another article on my blog. Thank you for these tips. Learning from your blogs makes writing liberating instead of suppressed thoughts and feelings… writing becomes an art of “free stroke” expression with colourful thoughts and feelings. Thank you for sharing your talent. That is a big compliment. Thank you. It cheers me up when people feel inspired to write after reading my blog. Happy writing, Lorna! Fantastic post, Henneke! Your examples shone with sensory details. Loved how the author of the thriller personified the cold into a deadly beast, and how we can use the same principles in our copy (to positive effect!). 🙂 This is one for the files. Thanks, as always, for your inspirational and educational posts! The various cold descriptions in the thriller are really inspirational. When you put them all on a sheet, you can see how varied they are. It’s like a masterclass in descriptive writing. I love the advice that you don’t always have to do it alone. I find that, even though you are its author/innovator, you can never fully understand how your product or service impacts the lives of those who use it. Only they can describe it vividly enough. Sometimes, to stir the emotions of those you are trying to promote your product to, you have to call on those who have used the product and have been affected by it. Testimonials and reviews are, thus, very powerful tools that, as copywriters, we don’t always value and utilize enough. Yep, I agree. Testimonials and reviews, too, are powerful tools. The best marketers (and the best copywriters) are close to customers because customers can give them all the input they need, and if you pay attention they write your copy for you. Thank you for stopping by again, Patrick. I appreciate it. Happy writing! I am feeling the precision point. Crisp! I dig it because I’ve focused on writing with precision recently. No filler. Think of how to say much with few words. Visualize experiences to make the the pictures to feel alive. Thanks much for the rocking post! That’s a good point about precision: Saying a lot with a few words is a challenge, but it’s a challenge I like! Thank you for your comment, Ryan. I appreciate it. There is a beautiful winter description in the autobiography of German writer Joseph von Eichendorff, describing the winter of his birth (1787/88). Now that’s a winter, is it? It just doesn’t get any better than this…good stuff! Hi Henneke, I enjoyed the article and the metaphors (by the way, metaphor exercises were my favorites during the course!). I also remembered Peter Høeg’s book “Frøken Smillas fornemmelse for sne” (“Smilla’s Sense of Snow in the USA) with amazing descriptions of snow that came from an inuit language of native people in Greenland. Thank you for stopping by, Irina! Whenever I read one of your posts…Everytime, and I mean Everytime I am never left feeling disappointed. Thank you so much, Wendy, for your lovely compliment. This is such an important topic and I love the examples you give. It’s so true; with all the content that’s out there already, you NEED to add personality to your writing if you want to stand out. Yes, without personality it’s hard to compete online. I totally agree with you. Awesome, Henneke, You’ve done it again. You never stop surprising me with something I really truly need at that moment. Love you, thank you, I’m so grateful for having you and your intuitive writing to support my own progress. What a glorious day this is, the sky is clear, the little waves on the ocean past the boardwalk are sparkling and dancing out of the bay, Ocean here we come. All because you made me look at it more closely. Thank you for adding your thoughts, Annamarie. Thanks Henneke for this great article. Thank you, Chooki. I’m glad you’re enjoying my blog posts. Thank you for stopping by. I really appreciated reading this post Henneke. What I ‘ve taken from this, and am experiencing in my own writing, is that it’s not ‘how much’ we write but ‘what’ we write that adds personality. Less can truly be more. We experience more too as readers. I rarely comment but I do enjoy your posts :-). Yes, that’s so true: “Less can truly be more.” I so agree with that. Thank you for leaving a comment, Bianca. I appreciate it. Happy writing! Love learning new ways to engage in the writing process. Now, it’s fun – like jumping through puddles on a warm rainy day – because it brings on the feeling of ease and effortless flow ! So glad my hubby found you. His joy for writing is infectious. It is mainly due to your class, and lucky for me, he shares his knowledge with the pleasure of a kindergartener ! Wild and free, so now we get to meet in the middle where structure creates freedom. I love your idea that writing is like jumping through puddles on a warm rainy day. What a beautiful metaphor! Thank you for stopping by to leave a comment, Amy, and do say hello to Chuck. Happy writing! I know I’ve said this before, but it’s the examples in your blog posts that take them to the next level for me. Thank you for the time you take to find them, they are worth their weight in raindrops ? I love your writing. It’s crisp and clear but also fun and entertaining. You make things simple and doable. I can see how some people might not like it, but as you say, those people are not the important ones; you will probably never win them over ?. I don’t know what to say; I’m speechless and happy and smiling. You’re playing a huge role in improving my copywriting, and I’m sure the same goes for many others. The way you encapsulate the ideas in simple words is fantastic. I learned from this blog post that how choosing the right words can make readers feel the depth of the story. Amazing. I’m looking forward to reading the next blog post. “make readers feel the depth of the story” — I love how you’ve phrased that, Hassaan. Keep up the good work, Henneke! Reading about the traveling in Alaska made me glad to live in England—it might be wet and it might not be as sunny as Florida, but it’s warm compared to Alaska. 24-hour darkness sounds tough, too. Thank you, Sudhaara. I’m glad you found it helpful. Happy writing! I’m obviously in the minority, but this kind of writing is awful. It doesn’t add personality, it adds corporate whimsy, which is artificial and pretentious. Firstly, not everyone needs to write with personality. For instance, if you’re writing for a bank, then people expect straightforward, plain copy. Ideally, the copy should be jargon-free (though most banks don’t seem to be able to do this). Secondly, this process doesn’t need to make copy whimsical. Look, for instance, at the example of Vitamix in the post. The tone is more serious than the copy of Purple. The right tone for copy always depends on the brand (or the writer) and who the audience is. You’re clearly not the intended audience for a Purple mattress. But that’s how good positioning works—you only attract the people that are right for your brand. I really love your point about impact. I used to be a senior marketing writer at a high tech company. I wrote stories directed to non-technical audiences about our work. Writing about the technology was boring to outsiders. But if I could describe how the technology helped first responders get food, water, and ice to disaster victims, the story instantly had more appeal. I love your point about telling stories to help explain how technology makes a real difference to people’s lives. The technical details are uninteresting outside a techie audience, but how technology changes lives is interesting for everyone. Thank you for sharing your story, Patty. I suppose in this area, a foundation in creative writing would certainly help to add flair to descriptions. The art of melding your creative writing voice and your professional voice to create a smooth, natural, non-stuffy persona that informs and also entertains readers at the same time —I think, Henneke, you have mastered it. I love how you start out your posts as though they’re stories. Thank you for this post. Informative and inspirational as always! Yes, I agree with you. Blending creative writing skills with an understanding of persuasion is a great combination. Thank you for your compliment! I appreciate your comments. I don’t usually comment on older posts, but your examples are so apt, I had to congratulate you, Henneke, brilliant as always. It brings to mind one of many things I learned from studying NLP …that while the majority of people are visual, with language that expresses their experience of the world such as “I see” and “look at it this way”, many are auditory, so their language is a little different: “that sounds interesting” and “listen to this”. A smaller percentage of people are kinaesthetic, responding to “I feel” and “that touches me”. Very few are gustatory, responding to smell and taste references. I have found it very useful to include words and phrases in my writing, especially marketing copy, that embrace different styles of expression and learning. For any reader who can’t imagine writing in a gustatory way, I recommend “Chocolat” by Joanne Harris. It’s a masterpiece of mouthwatering, scented writing that seizes the senses in every way! I am glad you took the time to comment on an old post. Thank you, Sue. I love your point on communicating multi-sensory experiences. I find that in different situations, I respond to different senses. When I think back to the places I’ve lived, my impression is often a combination of visuals, sounds and smells. It seems that smells can bring up strong memories for me. But when I write, my first drafts are often full of “I feel” (or “I think”). When editing, I remove these. Isn’t it fascinating how we’re all different? I’ve added “Chocolat” to my reading list. I look forward to reading it! Thank you for your recommendation. “She felt it filling her hollow spaces, embedding itself as icy marrow in her bones and then consciousness seeped away from her into the Arctic blackness.” That sentence really grabbed me and I needed to walk out into the sunshine. Ha, yes! Reading that book made me feel cold sometimes, too.